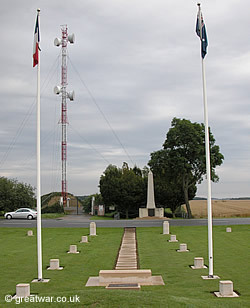 The Windmill Memorial looking towards the Tank Corps Memorial and the radio mast on the high ground north of Pozières village. The memorial is on the site of a windmill on the northern edge of Pozières village. From 27th September 1914 the German Army arrived in Bapaume and fought the French Army down the main road towards Albert during the next few days. Blocking the way to Albert, the French managed to hold off the advance of the 26th and 28th Reserve Divisions in this area. The German Army stopped its further advance a few kilometres south of Pozières on the main road at the village of La Boisselle. With the high ground at Pozières securely behind its forward line the German Army here had magnificent views of the countryside for 360 degrees. During 1915 and into early 1916 the German divisions in this sector of the Somme battlefield constructed a fortified Front Line between the villages of Gommecourt, Beaumont-Hamel, Thiepval, La Boisselle, Fricourt, and Mametz to Curlu on the Somme river. An Intermediate Position consisting of barbed wire defences and strongpoints was constructed behind the Front Line, and behind that a Second Position was built up. This Second Position comprised a series of strongpoints and observation points on good sites of high ground. The windmill on this high ground was used from September 1914 as a German field artillery observation post and command post. The views were magnificent to the front and rear of this position. The site was built up as a strongpoint just to the north of the fortified village of Pozières. On 1st July 1916 the British offensive had failed in it's attempt to cover and capture the ground between the German Front Line and the Second German Line on the Pozières ridge. Attacks in early July by the British Fourth Army on the German positions at Pozières had been unsuccessful. The 1st ANZAC Corps, arriving on the Somme battlefront from 14th - 18th July, took part in an attack on Pozières village on 23rd July 1916. The Australian 1st Division captured Pozières village by the end of that day. Capturing the site of the windmill to the north of the village was an objective in the attack, to secure observation from this point for the British over the German rear areas of Grandcourt in the River Ancre valley and Courcelette on the road to Bapaume. These two villages were situated on either side and to the rear of the German sector at Thiepval, which was still holding out in the original German positions attacked on 1st July. The capture of the ground at Pozières as far as a German forward command post at Mouquet Farm, between Pozières and Thiepval, and the ground at Grandcourt was considered essential to assist with the proposed envelopment and capture of Thiepval. After almost two weeks of bitter fighting the site of the windmill was secured by Australian Forces of 1st ANZAC Corps by the end of 5th August. One of the magnificent views from the Pozières Windmill Memorial, looking to the north. Courcelette British Cemetery can be seen in the middle distance. The forces holding this particular piece of ground on the Pozières ridge would have the advantage of being able to see for many kilometres in all directions. The movement of men, transport and guns would be visible to the enemy from here. For the German Army in July 1916, it was crucial to hold onto this location at all costs because it protected the views over their rear in the Thiepval sector north of the Albert-Bapaume road and the rear of their Contalmaison-Longueval sector south of that main road. Also, if captured, the Allies would gain a significant advantage by being able to see over the German Army's rear support and supply lines for this whole sector of the German Somme battlefront. Undulating ground at the remains of the windmill at the Windmill Memorial. The windmill was gradually smashed up by French and then British artillery fire. It was eventually reduced to a pile of rubble. 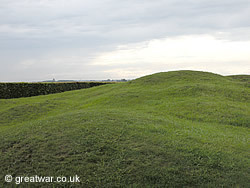 Remains of the windmill and the German blockhouse have been left and grassed over, leaving the undulating ground as a preserved battlefield site at this place. Detail of the bronze Memorial Plaque by Dr Ross Bastiaan at the Australian Windmill Memorial. One of the bronze memorial plaques by Dr Ross Bastiaan is located at the Pozières windmill memorial. Over 140 bronze memorial plaques have been placed around the world at sites of action by Australian Forces. 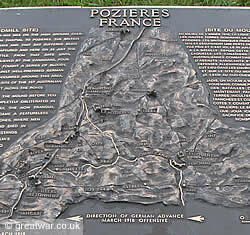 The plaque includes a relief map of the Somme battlefields, casualty figures and an overview in English and French of the part played by the Australian Forces in the Battle of Pozières Ridge. The memorial is located on the north side of the D929 Albert-Bapaume road just to the north of the village of Pozières. There is a limited area of parking in the form of a layby. This memorial is situated at the side of a very fast road and visitors are advised to take extreme care when moving about by parked vehicles. Children should be supervised here at all times. 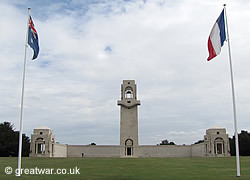 Villers-Bretonneux Australian Memorial to the Missing.